If you have never worn contacts in the past or are an experienced contact lens wearer interested in keeping up with the newest advances in contact lenses, we would love to work with you! At Clarity Eye Care, we are fortunate to be able to offer you the latest technology in contact lenses and contact lens care systems. In order to find a system that meets your needs, we work with all of the leading contact lens manufacturers and maintain a vast selection of soft contact lenses in stock. Dr. Bryant has been selected as a consultant for leading contact lens manufacturers and has participated in several clinical studies. Your contact lens evaluation will begin with a thorough evaluation of your vision and eye health, which includes computerized measurements of the shape of your eye. We will also discuss your leisure time activities and how you use your eyes at work. Using this information, your optometrist will prescribe the lens design, material, size, shape, and care system that will give you the best possible experience. 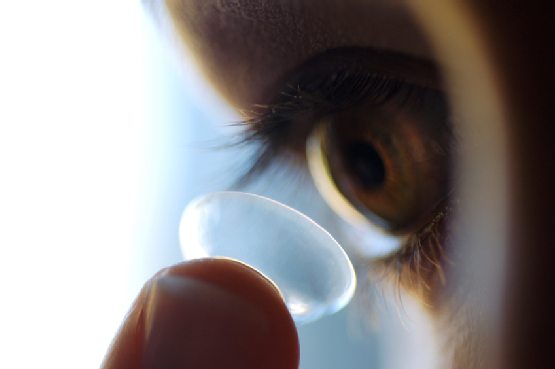 If you have never worn contact lenses in the past, we know that it can be a bit intimidating. We understand that it will take some coaching and practice to learn how to put them in and take them out. Our contact lens technicians will work with you in a comfortable, individualized training session and will spend as much time with you as needed. There is no pressure, and we want the experience to be exciting and fun. And no need to worry, we don’t expect you to commit to contact lenses until you’ve experienced life without glasses. On the day of your fitting, we send you home with your complimentary first pair of contacts. After you have worn them for about a week, we will have you return to our office to measure your vision, check the fit of the lens and your eye health, and answer any questions.